Having a go-to pair of jeans in your closet is a given—you know, the ones that fit you like a glove and are always your fallback on “nothing to wear” days. But, as much as you love your ride or die denim, there’s a wardrobe essential you may be overlooking: white jeans. The next time you’re ready to slide into your favorite pair, give your blues a break and slide into a crisp pair of white denim. Somehow fresh and familiar all at the same time, they’ll instantly elevate your everyday style. 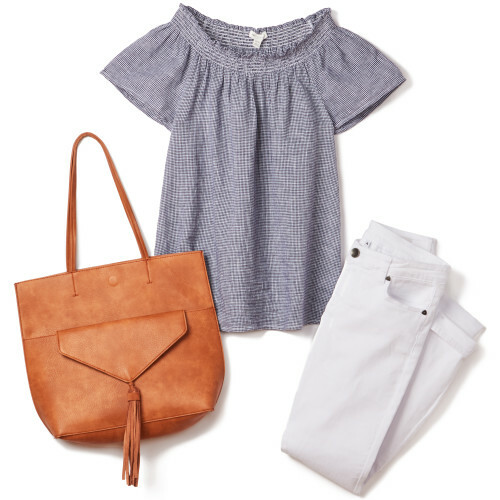 Take a peek at our outfit ideas for some inspiration on how to style white jeans. 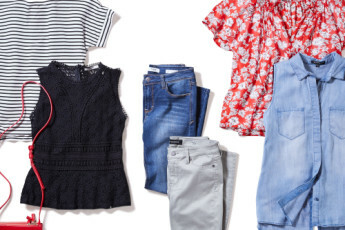 For a dreamy way to wear denim after dark, pair white skinny jeans with a pretty petal print. Lighthearted and effortless, it’s a gorgeous combination ideal for warm nights spent under twinkling lights. 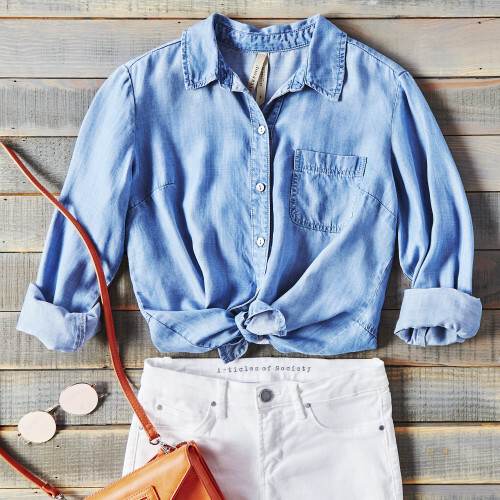 Bring off-duty denim into the work week by swapping your blues for bright whites. Add a timeless print like stripes or gingham and an oversized tote to transport your laptop in style. If you’re toughing out overzealous office AC, keep a cozy cardigan handy to ward off unwanted chills. 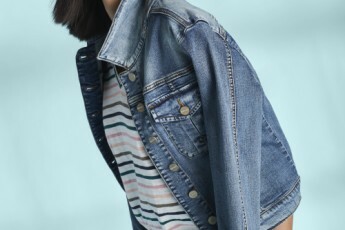 Instead of going full-on Canadian tuxedo, combine a comfy chambray button-down and distressed white skinnies for a fresh take on the look. These versatile, easy-to-pair pieces are also the perfect blank slate for your favorite accessories. 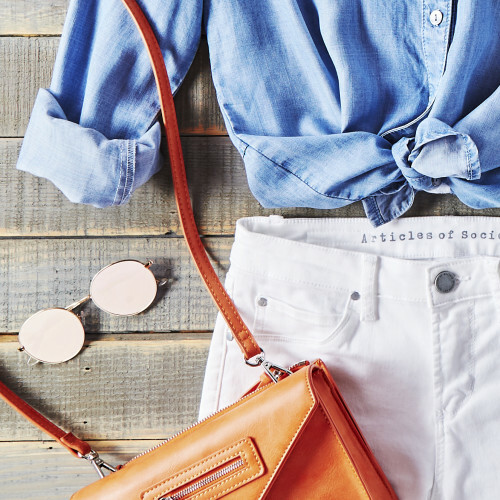 Try this duo with a bright crossbody bag, slide-on sandals, and statement shades. 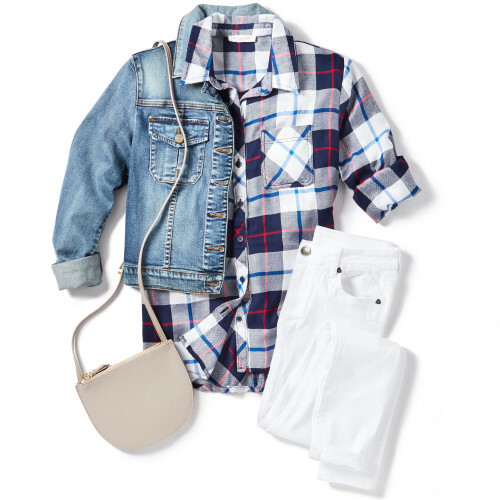 There’s no such thing as “too much denim,” but if you’re not ready to wear it head-to-toe, break up your double denim with a plaid button-down. Choose a bright-hued version of this classic print, and add a front tuck to create a tailored white jeans outfit that’s casual and comfortable with a touch of cool. Think beyond your tried-and-true skinnies, and add a white denim jacket to your weekend rotation. Refine your off-duty look by layering this summer staple over a casual knit dress and finish the look with a printed scarf. This fail-proof combo is great for any occasion from a backyard BBQ to Sunday brunch.